The Board of Jubilant Life Sciences Limited, an integrated global pharmaceutical and life sciences company met today to approve financial results for the quarter ended September 30, 2018. “We are happy to report another quarter of strong results. The record performance in our Pharmaceuticals segment has been led by continued growth in Specialty Pharmaceuticals and smart recovery in our Generics & API businesses. Demand in our Life Science Ingredients segment remains strong. The company is confident of delivering better results and is focused on continued strengthening of its balance sheet, going forward. We are confident that with our differentiated business model, unique pipeline of products and strategic investment in manufacturing capacities, we are well positioned for sustainable growth in the current year and future”. Specialty Pharmaceuticals revenues grow 71% YoY to Rs. 908 Crore (68% of Pharma revenue mix) driven by growth in demand in radiopharmaceuticals, CMO and Allergy Therapy Products and also addition of acquired Radiopharmacy business. New Lyo line under installation. Commercial operations expected from FY20. Specialty Pharmaceuticals reported revenues of Rs. 1,724 Crore, growth of 72% YoY, contributing 69% to Pharmaceuticals segment’s sales, driven by demand in Radiopharmaceutical, CMO and Allergy Therapy Products and also addition of acquired Radiopharmacy business. Sterile: 11 radiopharma registrations, all of which have been approved and 4 injectable ANDA filings, of which 2 are pending approvals. LSI revenue at Rs. 1,734 Crore, up 21% YoY, contributing 40% to the company’s revenues, down from 45% in H1’FY18, led by higher revenues in Life Science Chemicals offset by lower volumes and prices in Nutritional Products. 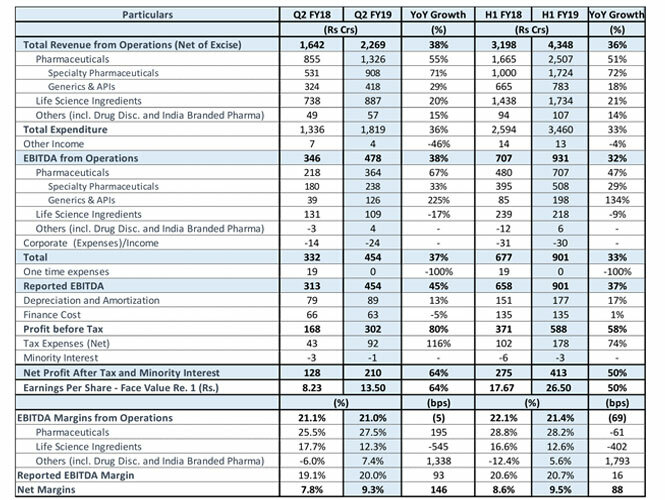 We expect better performance in H2FY19 as compared to H1’FY19 in both Pharmaceuticals and LSI segments driven by growth in existing products and capacity expansions for new product launches. We will continue our efforts to strengthen balance sheet by reducing debt and improving financial ratios. Jubilant Life Sciences Limited is an integrated global pharmaceutical and life sciences company engaged in Pharmaceuticals, Life Science Ingredients and Other businesses including Drug Discovery Solutions and India Branded Pharmaceuticals. The Pharmaceuticals segment, through its wholly owned subsidiary Jubilant Pharma Limited, is engaged in manufacturing and supply of APIs, Solid Dosage Formulations, Radiopharmaceuticals, Allergy Therapy Products and Contract Manufacturing of Sterile Injectibles and Non-sterile products through 6 USFDA approved manufacturing facilities in the US, Canada and India and a network of over 50 radio-pharmacies in the US. The Life Science Ingredients segment, is engaged in Specialty Intermediates, Nutritional Products and Life Science Chemicals through 5 manufacturing facilities in India. The Drug Discovery Solutions business, provides proprietary in-house innovation & collaborative research and partnership for out-licensing through 2 world class research centers in India. Jubilant Life Sciences Limited has a team of around 7,600 multicultural people across the globe and is committed to deliver value to its customers across over 100 countries. The Company is well recognized as a ‘Partner of Choice’ by leading pharmaceuticals and life sciences companies globally. For more info: www.jubl.com.